Suzanne Carpenter passed away at 73 on June 2, 2015 in Hospice of the Valley, just south of her home of 45 years in Litchfield Park, Arizona. Before she passed away, she passed on more wisdom, love and insight than anyone can ever imagine. Suzanne was born May 6, 1942 in Griffin Georgia to Edward and Jean Dottery. She lived in New Orleans and then grew up most of her life in Gulfport Mississippi with her mother and stepfather Clarence Bone. Growing up in the deep south created her southern charm and hospitality and made her a true southern belle, Also, as a very young girl, she sat in her room and read an entire set of encyclopedias, which explains her diverse and well-rounded knowledge in everything. It was in Gulfport that she met and married her loving husband of 55 years, Vernon Carpenter and as an Air Force wife for 20 years, they were stationed in California, Arkansas, Washington, Texas, North Dakota and finally Arizona. Suzanne and Vernon lived and worked in the Valley of the Sun since 1970. Throughout her life, she won beauty pageants, was lead soloist in operas and church choirs with her angelic voice, loved reading, teaching, cooking, gardening, crafting, computers, science fiction, politics, delta-blues and classical music, her kitties (who all lived over 20 years) and giving nothing but selfless love and support to everyone she knew. She taught at Glendale Community College right up until the day she was diagnosed with a brain tumor and cancer, and only had a few more weeks to say goodbye. As in every other challenge she ever faced, she fought hard to beat it, but she was diagnosed too late. Her family wants to extend their warmest thanks to everyone at the Mayo Clinic for their herculean efforts to help her survive. Suzanne will always be remembered as a loving daughter, sister, wife, mother, grandmother and teacher who shared all of her loves with her family, students and friends. 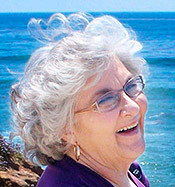 Suzanne is survived by her loving husband, Vernon Carpenter; her sons Brian, Ken and Mike, her daughters-in-law Kathy and Renee; future daughter-in-law Gayanne; grandchildren Brian, Brett and Christian; brother Ed and sisters Jenny and Dorothy, as well as many others who had the honor and benefits of knowing her glorious soul and character. She accomplished her number one goal which was to improve everyone’s lives and make the world a better place in doing so. She was the most selfless person any of us have ever known. Suzanne always said that when she passed, she wanted us to celebrate her life and not mourn her passing. It is tougher than ever imagined, but we should all do our best to honor her wish, therefore her celebration of life will be held Saturday, September 12, 10:30 a.m. at the Church at Litchfield Park, 300 N. Old Litchfield Rd., Litchfield Park, AZ.